PinkNoise Studio presents Luna, a high-powered performance synth that combines powerful analogue sounds with custom digital flexibility. 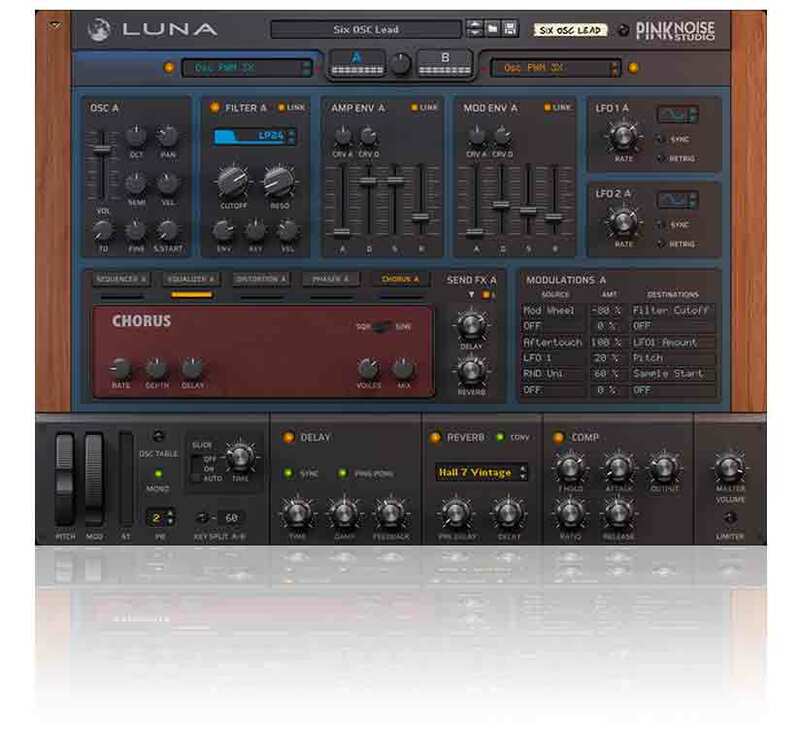 Powered by the sounds of the legendary Moog Voyager, Luna creates unique synth sounds through a two-part audio-architecture. Each layer contains 90 original sound sources that can be combined, isolated and re-synthesized into a new exciting synth sound. Each sound source is clearly labelled in terms of it's musical context 'Bass / Synth / Lead' have been painstakingly programmed to bring, powerful useful sounds in several genre contexts. Change and experiment with either of the layers instantly, with zero loading time retaining your inspiration. Optimised in over 100 custom-built patches combining unique FX units, signal-flow and a modulation matrix, the synth is ideal for keyboard wizardry, studio-trickery or sonic exploration. Experience evolving pads, deep booming bass, soaring detuned-leads, analogue-style strings, rhythmic arpeggios and much more. The rear panel offers additional advanced functionality such as CV sequencer, modulation and configuration controls to interact with other instruments in the rack. Performance and playability lie at the core of Luna factory bank with intuitive performance and modulation wheel routings at the core of every patch. Flex your keyboard skills with a split-key patch; compliment a breakdown with a FX preset or craft dense soundscapes with automation features optimised for Reason. • Polyphony bug, when the polyphony was set to greater than 32, an error occurred in exporting to audio, fixed. • Delay FX time bug, when you used absolute time, the delay time was incorrect after you re-opened the song, fixed. • Patch initialisation bug, fixed. All instruments from PinkNoise Luna. Drums from Propellerhead Reason Factory Sound Bank. Official demo song produced and performed by Masslevel for PinkNoise Studio's first Propellerhead Reason Rack Extension Luna.